tip of the iceberg. This is an apt description for the recent collapse of a large Antarctic ice shelf -- an apparent signal of an impending disaster. The catastrophe, blamed on global warming, had been predicted in 1998 by scientists from the uk-based British Antarctic Survey. Unfortunately, none paid heed to the warning. Experts say the collapse is a precedent for the future of glaciers worldwide. Glaciers are accumulation of ice and snow. On the basis of their size and underlying topography, they are classified as ice sheets, ice shelves, ice caps, outlet glaciers, piedmont glaciers and valley glaciers. Snow usually gets accumulated on a glacier's highest part known as the accumulation area. On the other hand, most of the melting and evaporation occurs further down in a region known as the ablation area. Between these two areas, there is a region where snowfall equals snowmelt. Here the glacier is said to be in equilibrium. Whenever this is disturbed, either by increased snowfall or by excessive melting, the glacier advances or retreats at more than its normal pace. Such glacial advances and retreats are natural phenomena that occur during glacial (time of accumulation) and inter-glacial (time of melting) periods. At present, the world is witnessing an inter-glacial period. However, the retreat in recent times has been much more rapid than the gradual retreat expected in such a period. Glaciologists blame the rapid rates on global warming. "Dramatic changes in the recession rates were the first indicators of global warming. Increasing levels of greenhouse gases have accelerated the natural process of glacier melting to a great extent," says Syed Iqbal Hasnain of the Glacier Research Group at Jawaharlal Nehru University (jnu), New Delhi. Global warming has even reduced the precipitation of snow. Over the years, the alarming recede has been well documented by numerous studies, including several done by the us G eological Survey. During these studies, satellite data about present area under glaciers has been compared with historical records and fluctuations in temperatures. The results show that recession rates have increased with rising temperatures. For example, with the temperatures rising by 1c, the Alpine glaciers have shrunk by 40 per cent in area and by more than 50 per cent in volume since 1850. For the past half a century, scientists from Switzerland-based Zurich University have monitored two specific Alpine regions called the Engadin and Simplon. Their findings indicate that in Engadin, 24 of the 54 investigated ice patches have vanished since 1955. In Simplon, 10 of the 31 bodies have melted completely since 1967. "Alpine glaciers are expected to disappear completely by 2050," says Martin Beniston of the Fribourg University in Switzerland. Australian glaciers are vanishing too. A recently concluded expedition of the Australian Antarctic division to the remote Heard island revealed that the island's 34 glaciers have decreased by 11 per cent in area and 12 per cent in volume. For instance, the island's Brown Glacier, which was 6.3 km long in 1947, had retreated by 1.2 km till 2000, losing more than 26 per cent of its area. The saga is unending. Since 1963, the Qori Kalis glacier in Peru has shrunk by at least 10 per cent. Its rate of retreat has been 155.5 m per year or 0.4 m per day! "You can sit there and virtually see the glacier retreating. Assuming that the current rate of retreat continues, this ice cap will disappear some time between 2010 and 2020," said Lonnie Thompson, a glacial geologist at the Ohio State University, usa. Quelccaya ice cap is another Peruvian glacier shrinking rapidly. It is at least 20 per cent smaller than what it was in 1963. Even Africa's Mount Kilimanjaro is receding at a fast pace. Its mapping since 1912 to 2000 indicates that its snow cover has shrunk by 82 per cent. Experts say that by 2015 it will have no more snow cover. It's not the only one -- the ice cap of Mount Kenya has also shrunk by 40 per cent since 1963. The Helm and the Illecillewaet glacier of British Columbia have both retreated by over 1,100 m starting from 1900. The Bering glacier in Alaska has shrunk by 10-12 kms in length during the past century, losing 130 kms of its area. Venezuela has lost four of its six glaciers since 1972 and Papua New Guinea is virtually bereft of any. The snouts of Himalyan glaciers are receding faster than in any part of the world, according to a study done by the International Commission for Snow and Ice (icsi). "The melting of Himalyan glaciers is a burning issue. The maximum damage can be seen in the central and eastern side," says Somnath Dasgupta, professor in the geological department of Jadavpur University, Kolkata (see 'Beating Retreat', Down To Earth , Vol 7, No 23, April 30, 1999). The Himalyan glaciers are extremely sensitive to changes in climate because they accumulate snow during monsoon and shed it in summers. "This is unlike Europe and other higher latitude glaciers that accumulate snow in winters and recede in summers. This gives them time to build up their snow cover," says Hasnain. 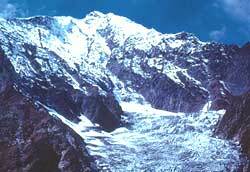 Among all the Himalyan glaciers, Gangotri has been the focal point of concern. "Its retreat in the last three decades has been more than three times the rate during the preceding two centuries," says Hasnain. Data from Geological Survey of India shows that between 1935 and 1996 the glacier retreated by 1,147 m -- an average rate of 19 m per year. The consequence of such recession is that Himalyan mountain lakes are being filled faster, threatening thousands of lives with colossal floods. This was revealed during a study conducted recently by scientists from the United Nations Environment Programme (unep) and International Centre for Integrated Mountain Development (icimod). The study showed that at least 44 glacial lakes in Nepal and Bhutan are growing in size so rapidly that they could burst their banks within as little as five years. A good example is Nepal's Tsho Rolpa Lake that is today six times bigger than it was in the late 1950s. A unep spokesperson said that such a problem is likely to be globally widespread, especially in South America, India and China. Bursting of such lakes and a fast recession rate would cause large-scale flooding and mudslides and eventual drying up of the rivers. This would indirectly have important consequences for water supplies, hydroelectricity generation and riparian habitats. Ironically, despite such adverse affects, the Indian government has undertaken no studies about the phenomena. "It is essential to know the net loss of glacial mass that occurs every year to assess the impact of global warming on glaciers. But no infrastructure is in place for this," says Hasnain. Agrees R Shreedhar, a geologist and trustee of the Academy of Mountain Environics, a Dehradun-based non-governmental organisation. "The government always waits for a tragedy to happen. Climate change is an issue ignored by the government. We lack technologies to assess our snow melt," he said. "Glaciers are studied by the government only for defence purposes. The results of such studies are kept confidential," says Sarfraz Ahmed, a glaciologist with jnu's Glacier Research Group. Official apathy is reflected in the fact that the Union government's department of science and technology (dst) does not acknowledge the crisis. "It is not definite that global warming is the cause behind the recession. Glaciers keep fluctuating. It is a natural process. There is no reason to be alarmed about," says K R Gupta, a scientist at dst, who is a part of the department's programme about glaciers. However, Gautam Ghosh of Geological Survey of India agrees that the government has shown a lax attitude towards assessing the impact of the recession. "We have not systematically identified the fluctuation caused by global warming," he says. Shreedhar opines that the only way out is to evolve disaster mitigation programmes and involve local communities in their implementation. "Good network of meteorological stations should be established and they should be run by local village councils," he adds. If the government fails to pay heed to these dire warnings, we may face a catastrophe of unprecedented scale.